The Lake Berkley gated subdivision is an idyllic, quiet setting in the heart of Kissimmee. 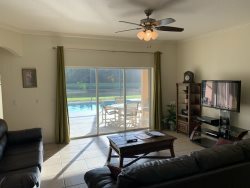 It offers Clubhouse facilities close to Disney and the shops and restaurants of 192. It is minutes away from Super Walmart and Medieval Times. The home itself has a private pool , 4 bedrooms and 2 full bathrooms. The spacious floor plan offers 2 sitting areas and 2 dining areas. This makes it great for 2 families to share. All the bedrooms have flat screen TVs and there is free wi-fi. The master bedroom is tastefully decorated in lemon and gray and has a King size bed. The adjoining bathroom has a shower stall and garden tub. The second bedroom has a queen size four poster bed. The third has a full size bed with iron headboard . The last bedroom has twin beds and is decorated with a biker theme for the young racers of the family! This Lake Berkley home is close to the Clubhouse making it a perfect spot for fun family times!